The physical form and adornments of pubs. I’ve already mentioned decorative tiling on pubs as a feature which helps to improve their appearance and draw people in. This is hardly the only strategy for enhancing the general attractiveness of the property; perhaps the simplest and most effective is the use of flowers and foliage. This can range from a few well-placed and colourful hanging baskets or flower trays above the doorway, to being so bedecked by ivy that the building underneath is barely visible. Hello, welcome back, it’s been a few months as usual! Figure 74. 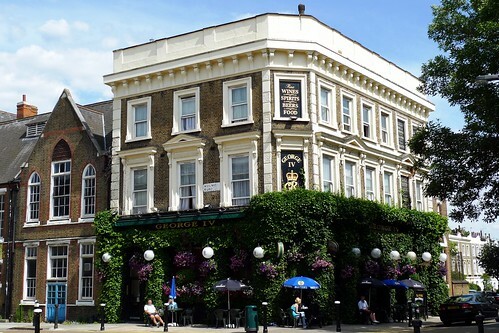 The George IV (Kentish Town NW5). There’s no real link between the amount and quality of foliage on display and the quality of the pub underneath (or its beer), but it at least betokens a certain regard for appearance that sets apart the publicans who really care about their premises. 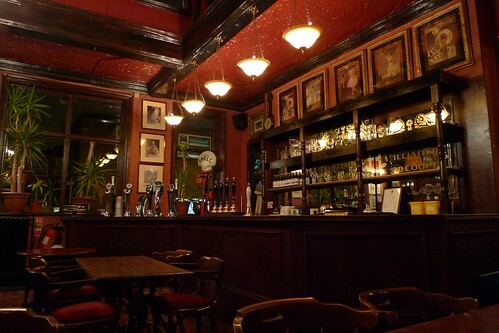 You may not be able to ascertain whether a good pint of ale will be available, but you can at least be sure that somebody cares about the pub experience enough to make it worth your while going in; there are worse methods by which to make a judgement about any particular pub. There are plenty of ways to increase the attractiveness of pubs — a bright new lick of paint, a few hanging baskets, wood panelling, hanging lamps, a sign — and I’m sure many of them will warrant their own posts in future, but one which has dwindled over time and now largely remains on just the older buildings is that of decorative tiling. Like the finest early-20th century tube stations by Leslie Green,1 it’s still quite easy to spot a turn of the century pub by the prominent glazed tiles (sometimes also referred to as faience) that adorn the exteriors. Some have been painted over, but smart developers know that these are distinctive and attractive, whatever the building’s use. Figure 55. 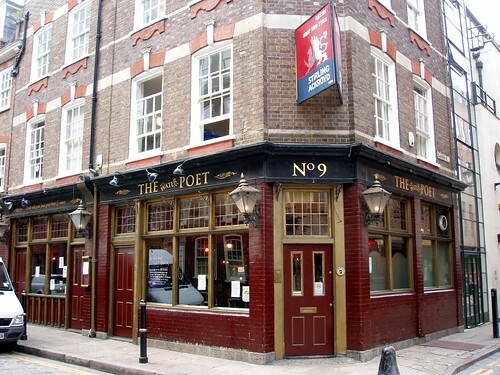 The Water Poet (Spitalfields E1).